TNI (Trinity Mirror) down 11.6%, far lower than the ASXX drop of 0.6%. We note the arrests this morning of two current and two former journalists employed by the Group as a result of the Metropolitan Police Operation Weeting. The police are investigating allegations of phone hacking on the Sunday Mirror in the period 2003 and 2004. This caused shares to dive further. 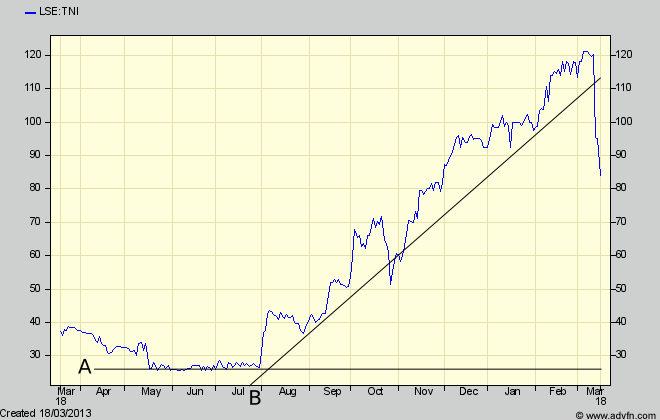 You can see from the charts that the uptrend line B has been well and truly broken. Looks bearish. There is a historic support line at 25p – so there could be a long way to fall. TNI made an incredible comeback from its scandal in October. Very mixed on this one. I think a lot depends on how far the share price falls, and what further news flows about the police investigations. Waiting on the sidelines seems the best policy – which, if anything, will probably cause the downtrend to continue. As ever, I’m a TA n00b, and you can draw lines to prove anything you want.